In this blog, I will show you how a marketing agency promoted a lead generation eBook through a sales team, and obtained 77 leads organically with just one social post. Marketing must be responsible for the companies growth. This means marketing agencies must drive revenue. The challenge marketing agencies face is getting the investment needed to create this meaningful strategy. When I say meaningful strategy, what I mean is a strategy that will actually grow the business and drive results. This leads to many marketing agencies getting caught up in just offering services. When we try to take responsibility for results and we say this is what it’s going to cost, so many times the client wants to whittle it down. When agencies struggle to get the investment needed it is hard to produce a clear return on investment. It took me around a year to figure out how to solve the problem, but the solution I found is one that made a huge difference in both my agency and in the marketing strategies of our clients here at Yip Yip. 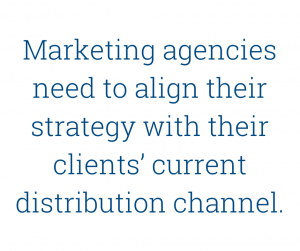 Marketing agencies need to align their strategy with their clients’ current distribution channel. What I mean by this is that most businesses have a primary distribution channel, bigger businesses may have more than one, but there is typically one channel that performs better than the others. For most businesses this is the sales department. This is where I (and most marketing agencies) made a mistake. I was recommending a strategy but I wasn’t stating how it would align with the primary distribution channel. I told them how it worked for other businesses, but I wasn’t saying how this would fit with their primary distribution channel and increase ROI. In most experiences, I was failing to show how marketing would be aligned with the sales team. Once I adjusted and started aligning marketing with sales in my pitch and my strategy things all clicked. People got excited about my strategies and what’s more is they typically would buy them instead of trying to whittle them down. When you align yourself with the things that drive revenue and take responsibility for results you can really write your own ticket and request the investment you need for a meaningful strategy. One of our clients here at Yip Yip, GiANT Worldwide, implemented this strategy through an agency and saw great success. Previously, they were doing most of their digital marketing via their businesses social media channels. They had lots of quality content, but saw low engagement and few results. GiANT decided to partner with Yip Yip to not only share their content on their channels, but to also brand and offer the content to their sales reps to share. everything for them quickly and easily. Before partnering with Yip Yip, GiANT was getting very few leads from their eBook and saw low blog traffic. After partnering with Yip Yip and implementing a strategy that maximized their primary distribution channel. 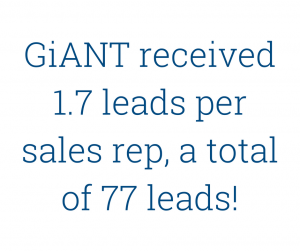 Just from one organic social post, GiANT received 1.7 leads per sales rep, a total of 77 leads! They went from no leads from social media, to 77 leads in just 1 organic social post through Yip Yip! We decided to look into this and found that because everything was personally branded for the sales rep, their network was more comfortable entering an email to download the eBook. This goes to prove that when you align marketing and sales, or with whatever your client’s dominating distribution channel happens to be, you can call for more finances and a higher investment. This made a huge difference for my agency and it continues to make a difference for our clients. If you’d like to experience the same results as GiANT, you can get set up today with a free trial! Contact us today so you too can start generating lots of leads through your clients sales reps.